Hanoi (VNA) - An outdoor photo exhibition showcasing the beauty of the landscape, culture and people of ASEAN countries opened at Ly Thai To Statue Square on Hanoi’s walking street on August 5. The exhibition, titled “ASEAN Countries and People”, is organised by the Ministry of Culture, Sports and Tourism on the occasion of the 50th founding anniversary of ASEAN (1967-2017). The event displays 230 works by 136 photographers from 10 ASEAN countries, 61 of whom are Vietnamese. Fifty photos were taken in Vietnam, while 180 others were captured in the other nine ASEAN countries (20 photos each), all of which vividly and truthfully depict the country, people, culture, society, economy and exchange activities of the member nations. 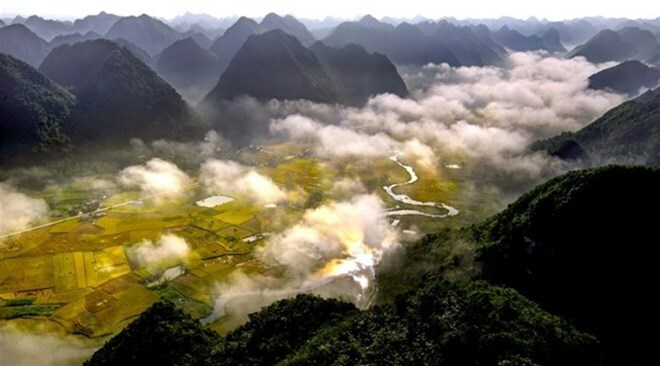 “This is the photographic exhibition with the highest number of entries that has been held by the Ministry of Culture, Sports and Tourism of Vietnam in recent years. The photographic event will enhance mutual understanding and relations among the countries, contributing to building a unified, active, developed, peaceful and prosperous ASEAN community,” said Vi Kien Thanh, head of the ministry’s Department of Fine Arts, Photography and Exhibition. The organising board also revealed that the exhibition has attracted the attention of many photographers within the region. Since the submitting and marking of the entries was conducted via the internet, many countries sent a large number of entries by a number of participants. The 10 most outstanding works by 10 photographers, who are also representatives of 10 ASEAN countries, were awarded trophies titled “ASEAN photos - 2017” by the organising board. The awarded photos present new angles of the beauty of the local culture and people, such as We Love Malaysia by Tan Ee Long from Malaysia, Kyite Htee Yoe-The Golden Rock Pagoda by Nyaung U Than Htay from Myanmar and Bac Son Valley by Vu Kim Khoa from Vietnam.